Space weather scientists in Northeast Canada have spotted holes opening in Earth’s magnetosphere. Now a massive, deadly eruption of solar radiation is barreling toward the planet at one million miles per hour. With only three days before impact, the president of the United States desperately turns to two unlikely heroes for help: inventor Calder Sinclair and physicist-turned-news-correspondent Allie Armendariz. As they and the world focus on the looming disaster from space, someone is secretly plotting to wreak havoc globally on the ground. If successful, the fiendish plan will hurl modern civilization back to the Nineteenth Century. 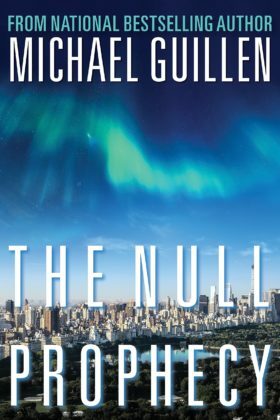 Guillen skillfully weaves heart-racing suspense with deeper questions about the profound consequences of scientific innovation, both intended and unintended. As his heroes search for answers, they run headlong into questions about human origins and the meaning and purpose of life and death. Racing the clock, Calder and Allie battle personal demons (as well as each other), all the while inching closer to a staggering truth foretold in ancient literature that decisively spells out the world’s future—the Null Prophecy.